Being handy in nature, pocket lighters are becoming a key part of daily used items for consumers worldwide. Their usability leaps beyond lighting a cigarette as these pocket lighters are becoming life savers for people stuck in critical situations. By providing adequate source for heat and flames, pocket lighters are being widely used in day-to-day setups. Key manufacturers of pocket lighters are increasing the attractiveness of their products by introducing new designs and advanced features. In the coming years, a range of pocket lighters are expected to be flameless, with technological advancements allowing companies to introduce products that are high on consumer safety. Growing incidences of health risks and fatalities caused from pocket lighters has created an environment of negativity across the market. New products are not capturing the expected attention of loyal consumer bases such as cigarette smokers. Marketing strategies of prominent pocket lighter manufacturers are running against the wall for failing to offer improved safety. Developments towards offering child-resistant pocket lighters are unable to draw in investments. Companies are losing the bourse traction with rising incidences of exploding pocket lighters. Transparency Market Research foresees the global market for pocket lighters to evolve at a sluggish pace in the coming years. 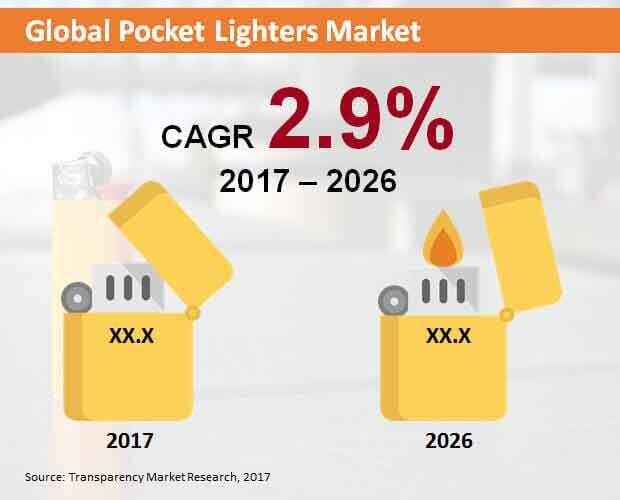 Owing to a range of safety issues, the global pocket lighters market is likely to reach a value of nearly US$ 7.4 billion by the end of 2026. The report also assesses that the global pocket lighters market will expand at a nascent 2.9% CAGR in terms of value over the forecast period, 2017-2026. In 2017, more than US$ 4 billion worth of flint cigarette lighters were sold across the global pocket lighters market. Being the initial stage of product innovation in pocket lighters, flint cigarette lighters will continue to be sold widely for their conventional usage and refilling convenience that extends their service life. However, presence of pressurized gas increases the risk factors of exploding for flint lighters. Between 2017 and 2026, the share of flint cigarette lighters on global pocket lighters market value is pegged to incur a dip of more than 2%. Electronic cigarette lighters, on the other hand, are expected to be in great demand in the coming years. By the end of 2026, more than US$ 2 billion worth of electronic cigarette lighters are expected to be sold across the globe. Longer service life of these pocket lighters will drive their sales in the global market, reflecting a value CAGR higher than that of flint cigarette lighters. Société BIC S.A. is known for being a top brand in the global market for pocket lighters. The report also observes a significant presence of Tokai Corporation, Clipper, Swedishmatch, Ningbo Xinhai, Zhuoye Lighter, Baide International, Focus, Benxi Fenghe Lighter, Wansf, Hefeng Industry, Cixi Xinyuan Cigarette Lighter, and Deko Industrial as key players in the global pocket lighters market. In the coming years, several companies are likely to focus on offering flameless lighters and developing the existing pocket lighters by adhering to new consumer safety standards. Increasing number of individuals adopting smoking habits continues to directly influence the sales of pocket lighters across the globe. In the recent past, usage of pocket lighters has leaped beyond lighting cigarettes; consumers are carrying them on daily basis for serving several purposes that require heating up or flames. In the future, pocket lighters will become a common product used on daily basis. However, their safety issues will create a considerable constraint upon their sales. Several incidences of pocket lighters exploding and causing injuries to users have deflated their demand. Child-resistant pocket lighters are failing to take off and market players are struggling to infuse highest safety into their products. Transparency Market Research has developed this exclusive forecast study to estimate the evolution of global pocket lighters market for the period, 2017-2026. This report assesses a range of factors and business aspects encompassing the production and sales of pocket lighters for the near future. A key advantage of availing this report is assessment of key trends that will influence the future of global pocket lighters market. From new flammable technologies to emergence of flameless pocket lighters, a slew of latest market trends have been identified and analyzed to weigh their impact on the sales of pocket lighters. This report has been developed on the basis of information procured from constant dialogue between market players, industry leaders, trade analysts and opinion makers. Consumer-side and supply-side analysis of such information has revealed new opportunities for pocket lighter manufacturers to capture in the coming years. Multidisciplinary research methodologies have been adopted to create an all-embracive analysis of key market data. Multiple parameters have been employed to generate valuable datapoints on the evolving value chain of pocket lighters. The report has interpreted the forecasted market size estimations across metrics such as compounded annual growth rates, segmental share, company shares, and absolute dollar opportunities. The extensive segmentation employed in the development of this report has been illustrated below. Key manufacturers of pocket lighters have been profiled in this study to understand the overall competition landscape of the global market. Presence of these companies across different geographies has been reflected through an intensity map that reveals the regional dominance of each market player. New developments in terms of product innovation, regulatory challenges and notable mergers & acquisitions of market players have been disclosed in an unbiased manner. The report has also revealed the current market standings of these players, revealing accurate information on market positioning and competitor analysis. Inferences from the report are aimed to extend the understanding of a pocket lighter manufacturers towards the future of the market. This report serves as a credible business document that offers first-hand forecast and analysis on the global pocket lighters market. Such valuable information can be repurposed by companies in devising their strategies for the near future.